The Pana-Vue 120 Archival Negative Page is safe for long-term storage. Made of archival quality, acid-free polyethylene, this page features a data panel on each slot. 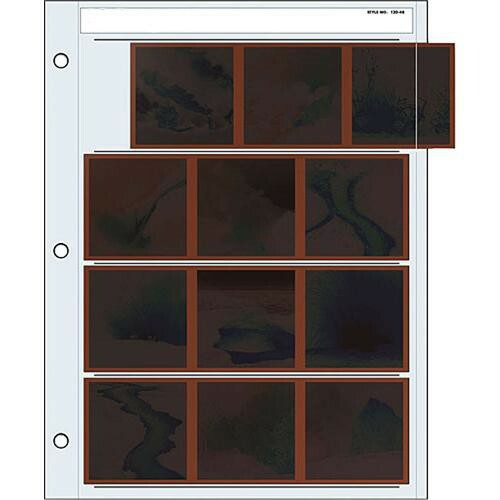 Box Dimensions (LxWxH) 20.7 x 11.4 x 0.25"
120 Archival Negative Page (4 Strip, 3 Frames, 25 Pages) is rated 4.7 out of 5 by 3. Rated 4 out of 5 by Anthony T. from What else could you use, these are the best. Simple product thats crucial for the longevity of your film negatives. It does what its suppose to and I have no complaints. I believe these are a must have if your an analog Photographer. Rated 5 out of 5 by CMGenius from Fantastic Does what it says. Seems thick enough to store negatives for a long time, and fits in my 3 ring binders well. Will order more of this brand as soon as I run out. Rated 5 out of 5 by Deedee from Ok sleeves These sleeves are ok. I could only fit two frames 120 film per row. They area little flimsy.